Pioneer Works joins forces with Google’s Made with Code for the first-ever Art x Code program from July 25-29. For this week-long symposium, ten high school girls from the New York region will collaborate with esteemed educators and technologists to learn the foundations of game design, coding, generative graphics, and virtual reality through one-on-one mentorship and interactive educational experiences. Art x Code is backed by an ambitious mission: to encourage the increase of women represented in the creative technology sector. Studies show that in middle school, 74 percent of girls say they’re interested in computer science. By high school, this drops to below 1 percent. What’s happening in between? By instilling positive discourse and acknowledging the overwhelming, creative potential that exists in this field, Art x Code hopes that young women will feel empowered to pursue their early passions in technology and to contribute their voices to a field impacting our lives more and more each day. 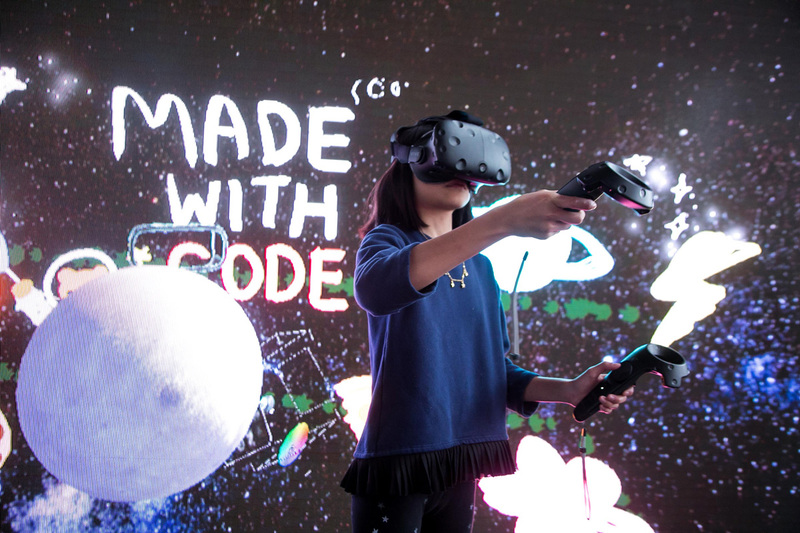 The final product of Art x Code will be a virtual reality experience that includes a basic interactive game built for HTC Vive and geared towards teenage girls. In the Generative Game Lab, the girls will make connections between real-world games and code-based games — the basics of game design. Students will be asked to look at sports, card games, and other non-computerized games as a game designer would, translating the interactions and rules that apply in the human world into logic that a computer can understand. At the end of this unit, they will design a number of simple games, which will be incorporated into Scratch, a block programming language. Next, the girls will learn the concepts of object-oriented programming, including parameters and variables in Scratch. From here, they will construct their own two-dimensional objects and learn how to control them parametrically. After creating objects in 2D, they will be introduced to creating objects in 3D space. At the end of the unit, students will be able to generate 3D objects in Unity, a free, powerful game design engine. In the final unit, the girls’ full potentials will be met when they create environments in Unity. They will add their 3D objects into a virtual reality environment and build the games designed in Scratch. This will allow them to experience modern game design using Unity and introduce them to the concept of cameras, controllers, and manipulating objects in 3D with basic physics. The final product of Art x Code will be a Virtual Reality experience created by the young women that includes a basic interactive game. The game will be built for the HTC Vive.